In a perfect world, chopping onions would never be necessary. They’d simply be available in your pantry at any time, ready to be sprinkled into any recipe. 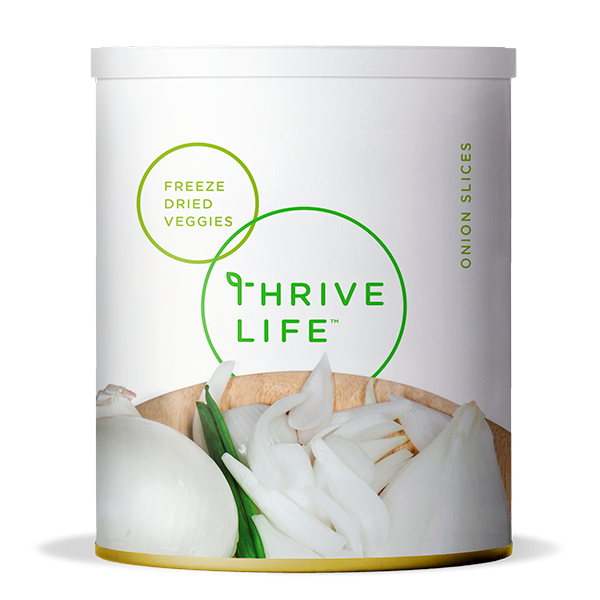 Well, we can’t claim this is a perfect world, but THRIVE chopped onions have certainly made it better. Arriving at your home in diced-size pieces, you can immediately saute them in butter, add them to a soup, or mix them into a breakfast casserole. Voila! Add 3 tbsp water to 1 cup Onion Slices and stir to coat. Let sit 2-3 minutes until tender. Already sliced, toss these onions in with chicken, peppers, and your favorite spices for an awesome fajita!